by using a PIN or by presenting a valid token to proximity readers. Token management is slightly more involved compared to a PC based system, but still straightforward to apply. 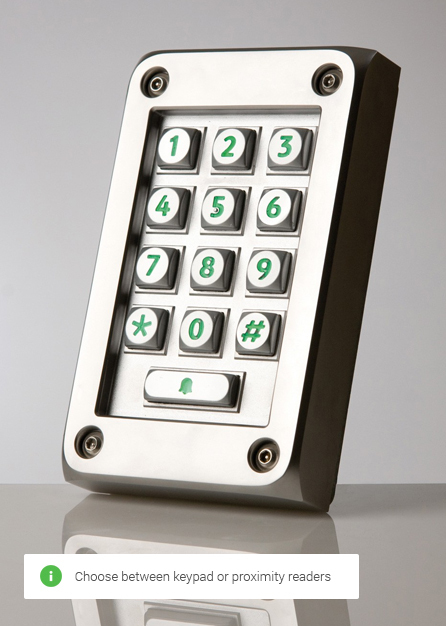 Keypad PINs can be updated on a regular basis to maintain security whilst proximity or CARDLOCK readers are supplied with a pack of user tokens, including a shadow and enrolment card. Once installed, your new access control system will be fully set up and demonstrated to you. We always put aside time to answer any questions to ensure you are fully satisfied with your new security system. Installation is very straightforward for compact readers. Due to their all-in-one design, featuring both the reader and control unit in one, each unit can be installed in minutes. The compact range is extremely cost effective, reduced installation times also help to keep costs down. Make the jump to electronic access control with Hewes Security, speak with our experts today.